It has been generally assumed that certain categories of numerical expressions, such as ‘more than n’, ‘at least n’, and ‘fewer than n’, systematically fail to give rise to scalar implicatures in unembedded declarative contexts. Various proposals have been developed to explain this perceived absence. In this paper, we consider the relevance of scale granularity to scalar implicature, and make two novel predictions: first, that scalar implicatures are in fact available from these numerical expressions at the appropriate granularity level, and second, that these implicatures are attenuated if the numeral has been previously mentioned or is otherwise salient in the context. We present novel experimental data in support of both of these predictions, and discuss the implications of this for recent accounts of numerical quantifier usage. 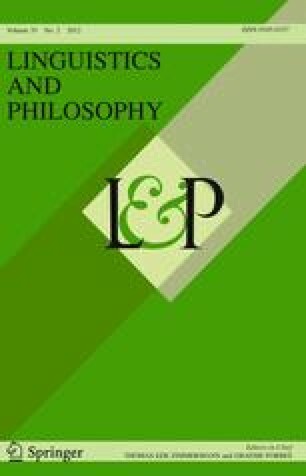 We are grateful to Chris Potts and to two anonymous reviewers for Linguistics and Philosophy, for their valuable comments and suggestions. Portions of this research were presented at the EURO-XPRAG Workshop (Leuven), the 2011 LSA Annual Meeting, the 2011 Annual Meeting of the DGfS, and the 4th Biennial Conference on Experimental Pragmatics, and we would like to thank the various audiences for some very helpful discussions. Financial support for this research was provided by the EURO-XPRAG Network, and by the DFG Grants SA 925/1 and 925/4, the latter within the context of the ESF EuroCORES LogICCC project VAAG. The first author was also supported by a University of Cambridge Domestic Research Studentship. Thanks also to Nicole Gotzner for assistance with the online experiments and to Leah Francis for assistance with the off-line task.